Keeping up with music releases in the age of the Internet is like a full time job. Mass lists of every new album every Tuesday means wasting time looking past the artists you don’t care about, and everyone knows that the indie blog you read refuses to cover those must have guilty pleasures. Enter Nomis, an app that scans your iTunes from your device and lets you know when anything new is released from the artists you already know you love. In other words, Nomis is like your all knowing music genius friend who always knows what’s up but isn’t afraid to talk a little Britney, Whitney and Justin. The only difference is that Nomis can’t make recommendations for new artists, but where your friend might miss a few release dates here and there, Nomis is like clockwork. Here’s how the app from Taprockets works. 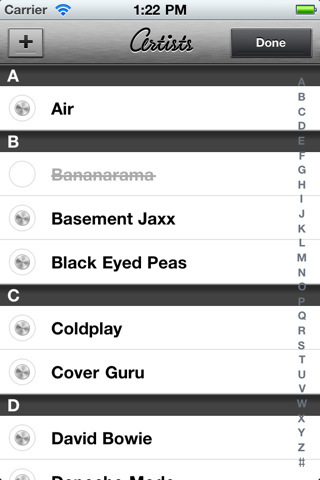 As soon as you download Nomis it will scan your iTunes library. This process takes a few minutes but it’s well worth it. 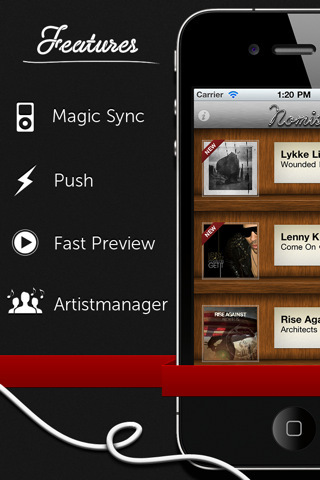 After you’re in sync the app displays a beautiful scrollable dashboard that resembles a hip wood bookcase. Each release fills one shelf with a thumbnail of the album cover while the right hand side reveals the artist name, song name, date, and tells you whether the release is a single, EP, or album. From there you can click on any of the releases to view the item(s) on iTunes. 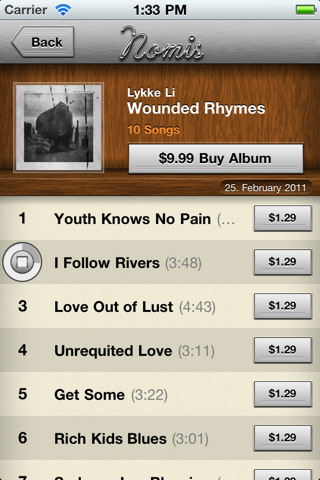 You can preview the song and even buy it by clicking a button that lets you open the song directly from the iTunes app. The process may not be instantaneous, but it’s about as close as anything like this is going to get. If you decide to turn on notifications in Settings Nomis does everything you need to stay up to date, dinging when you have something to be excited about and letting you enjoy your music like normal the rest of the time. What’s more is that you can use the Edit button in the upper right hand corner to cross artists off your list to keep track of. Overall Nomis does a brilliant job of keeping you informed in a sleek, seamless manner. The interface is detailed, the functionality is simple, and the task it executes is a miracle. The only improvement I could dream up for is the ability to provide recommendations based on the artists you already own or go through your entire iTunes collection (not just what’s on your device). Beyond that Nomis couldn’t be better. 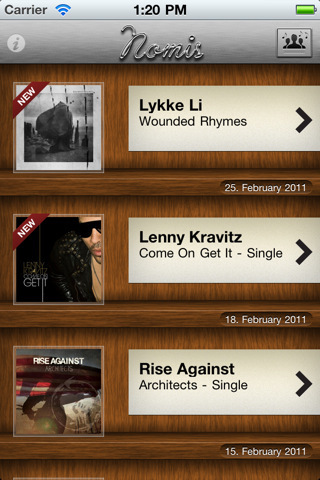 Bottom Line: Nomis is a must have music new releases app that will keep you updated on the music you like quickly and easily. There’s nothing better (that I know of) to achieve the task.